Santa Paws is now done his yearly visit to the good dogs and cats of the world, and things are slowing down some here at the DRC Workshop. This season the Santa Paws for a Good Cause promotion was rather popular. 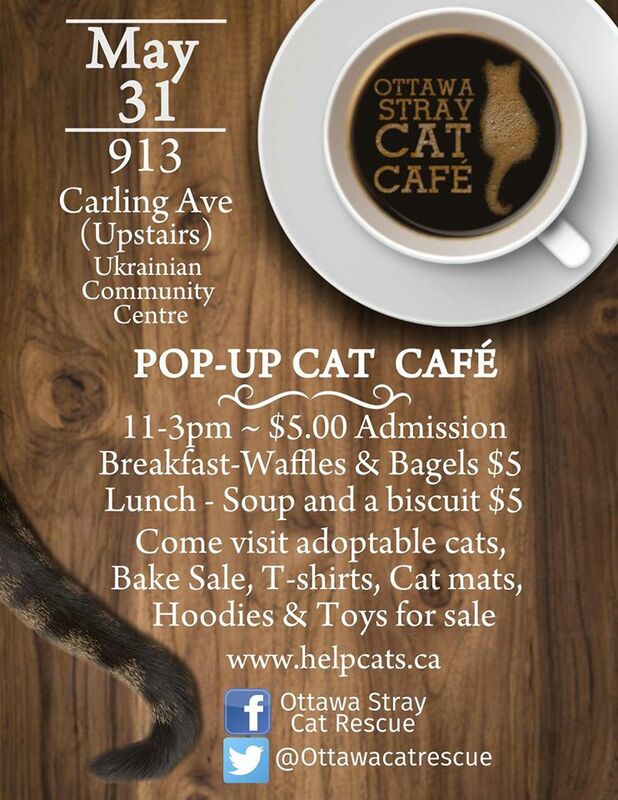 All together we raised $55 CAD for the Ottawa Stray Cat Rescue! It went over well enough that I’ve decided to make the Santa Paws stockings a permanently available item on my Etsy Shop. So now we can help stray cats all year long! Happy Caturday everyone from the Zoo at the DRC Workshop! Just wanted to share this picture of Tray helping me take pictures of the Santa Paws stockings. From each stocking sold between now and December 24, 2017 $5 CAD will be donated to the Ottawa Stray Cat Rescue. Stockings may be purchased via Etsy. If you are in the Ottawa area and want to save on shipping by picking it up feel free to contact me via this website or my Facebook page. This year at DRC we decided to help out some stray cats with our Santa Paws stockings. From now until December 24, 2017, we will donate $5 CAD from each Santa Paws stocking sold to the Ottawa Stray Cat Rescue! Stockings may be purchased via here via my Etsy Shop. If you live in the Ottawa area and wish to save on shipping by picking it up, contact us via this website, our Facebook page, or via our Etsy Shop. Total amount raised will be posted on December 25, 2017! 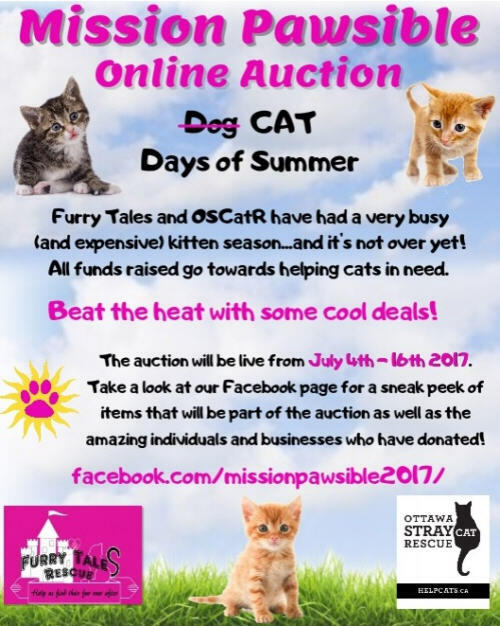 Until July 16, 2017 Mission Pawsible is having an online auction! The proceeds of the auction go to help out two wonderful animal rescues in Ottawa, ON; The Ottawa Stray Cat Rescue and Furry Tales Rescue. ‘Between the two rescues, there are over 200 cats in care with daily requests to take in more cats. The rescues cannot take in cats and help them find their forever homes without the funds to make sure the cats have been vet checked, vaccinated, spayed/neutered and microchiped. Adoption fees do not cover associated medical costs so fundraisers like this one help to bridge the gap. The auction is not just for cat lovers! Many of the items were donated by restaurants, jewelry makers, services, and the list goes on. Bearly Work Creations and I donated a suPURRvisor basket to the auction. The suPURRvisor basket is a wicker basket with a pillow and a wooden sign for the front that says suPURRvisior that a small to medium sized cat can fit in. 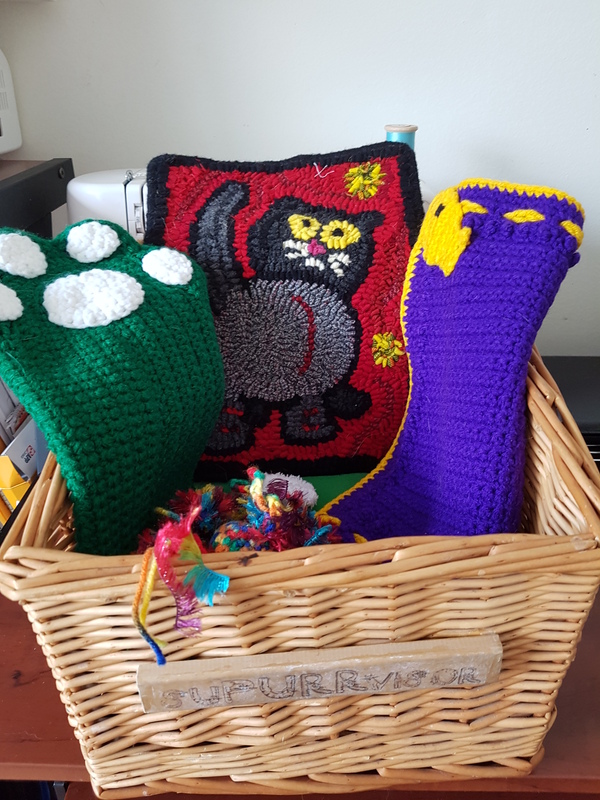 In the basket is a pillow, a hand hooked wool rug called Fat Cat from Bearly Work Creations and a number of crocheted things by me; a placemat, a Santa Paws stocking, and a Jingle Jangle toy. 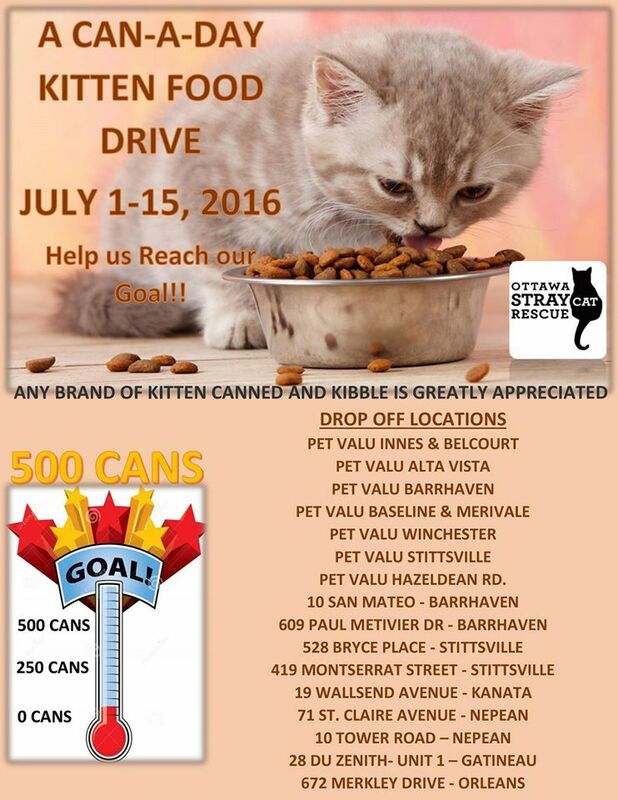 It’s kitten season and the Ottawa Stray Cat Rescue is in need of some help. They have over seventy , yes 70!! , kittens in care right now. It takes a lot of food to keep those little bellies full! Please consider helping them out. You can check out their website or Facebook page for more info about the rescue and all of the wonderful work they do. Looking for something to do tomorrow in Ottawa? Love animals in Halloween costumes? 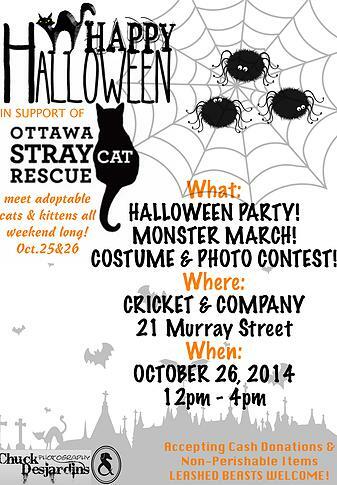 Then you should be at Cricket & Company‘s Halloween party in support of the Ottawa Stray Cat Rescue! Don’t miss the Monster March through the Market from 12:30- 1pm! Animals! In costume! On parade!